‘Only 8% of people trust what companies say about themselves’ – this recent shocking statistic is representative of the problems facing the majority of businesses. Companies may have become more efficient at advertising and targeting sales but they have become less trustworthy. This is a major problem which isn’t going away. Without trust, businesses cannot build long-lasting relationships with their customers and therefore cannot create brand loyalty. There are many reasons behind this shift but there are ways for companies to turn things around. There have been a lot of changes within advertising in recent years, many of which are to blame for the lack of trust between companies and clients. For example, many consumers are uncomfortable with their personal information being shared without prior consent. Another issue with advertising is how the actual products and services are described. Some businesses exaggerate the benefits of their products and therefore make it extremely difficult for the products to live up to the hype. This leads to a disappointed customer who is going to take their business elsewhere in the future. 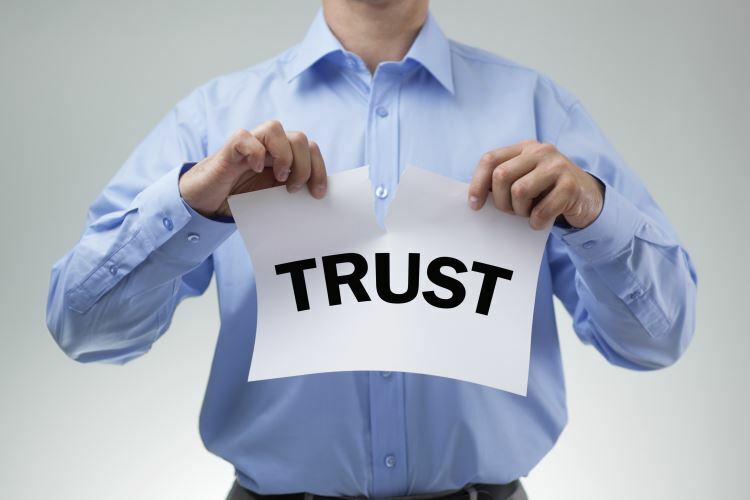 The best way to engender trust within your customers is to be respectful and honest. This means advertising products truthfully, without exaggeration. Incorporating customer reviews into your product pages will also help in creating a well-rounded outlook of your products and services. Profit and sales are vital to any business but they shouldn’t come before your customers. Many companies will endeavour to sell products and services to customers, whether the consumer needs them or not. This can be particularly unethical when it comes to vulnerable people such as the elderly. There is a way to chase profit and still operate as a conscientious and thoughtful company. One of the best ways to achieve this is by finding your client base. Target the group of people who are already looking for your products and/or services and sell to them. As well as helping to build trust, this approach can also make much more sense financially compared to targeting everyone. Customer service offers a direct relationship between businesses and their client base. This allows companies to showcase how they treat their customers and this will dictate future interactions. The best away to approach this issue is to listen to each and every customer and treat every correspondence with the same priority. Some customers will have complaints but businesses should remain calm and try their best to remedy the problem at hand. Many companies now offer a wide range of customer service options, which is highly appreciated by consumers. This means offering traditional communication methods such as telephone, email and post, as well as more modern options which include instant chat, social media or even video chat. The easier you make it for the customer, the more likely they are to return to you in the future. Branding can be powerful tool, not only for boosting sales but also for showcasing yourself as a reputable, customer-centric company. There are many ways to build a brand identity which focuses on both business and people. For example, many organisations work hard to combat their carbon footprint and encourage others to do the same. Some businesses are incredibly philanthropic and will complete pro-bono work alongside their paid services. These are just some examples of the ways in which branding can effect trust. Any company can forge successful relationships with their consumers by projecting an honest image of quality, reliability and respect. Unfortunately, although very few consumers trust organisations within the corporate world, this can change. Many newer businesses are going against the traditional business model and beginning their journey with mutual respect in mind as opposed to profit no matter what. This entry was posted in Observations & Answers on September 29, 2015 by Jamie.